Steve was born in the fast paced city of Poughkeepsie, New York, but moved to Las Vegas when he was 1 and has grown up in Las Vegas. Steve attended Bonanza High School while also participating in the Explorer program from the age of 16. Steve was hired out of high school as a Cadet in August of 1998. After completing 2 ½ years as a Cadet, he attended the Police Academy. After graduating the Police Academy and Field Training, he was assigned to Northwest Area Command on the graveyard shift. Steve later transferred to swing shift and then spent a short time being a Field Training Officer. After training, Steve was transferred to the Problem Solving Unit where he spent 3 years conducting several different types of investigations from Attempted Murder cases to residential Burglaries. 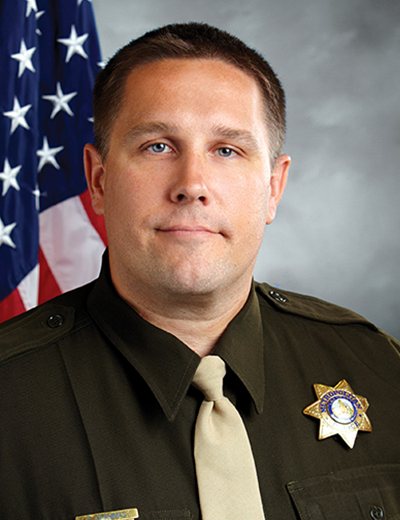 In February of 2009, Steve had the privilege of transferring to the Narcotics Section where he spent the next 5 ½ years working as a Case Agent Detective, drafting Search Warrants and running covert cases as well as conducting Dynamic Search Warrant entries, as well as an Undercover Detective making purchases from known felons in the Las Vegas valley. During his career, Steve has been involved in almost every area of law enforcement. Steve received training in Instructor Development and became a Master ODV instructor and has taught classes at the Academy as well as In- Service training. In March of 2013, Steve took the Bermuda position on the PPA Board of Directors. Steve then transferred full time to the PPA Executive Board in August of 2014. Since being on the E-board, Steve responds to OIS’s and other callouts as well as attends CIRT, FIT and IAB interviews with PPA members. Steve also takes part in the Use of Force Board process and has attended Accident Review Boards where he also assists members of the PPA. Steve is a part of several committees at the PPA and is the current President.